The Converse Blog: 'S Friday Flashback: Converse Classic Golf. Welcome to the Converse Blog's Friday Flashback. Today's Flashback is the Converse Classic Golf shoe. 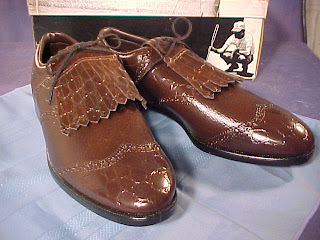 Back in the day Converse made Golf Shoes, and that's exactly what these are. 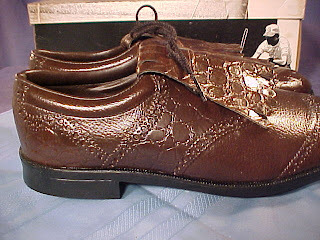 Brown Leather, Metal Spikes, Lace Guard flap, it's all right here in these Converse Classic Golf shoes. 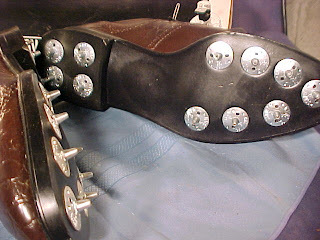 Today you'd be hard pressed to find anyone playing golf with metal spikes, but it used to be the only way to play. They aren't even allowed at our local country club, which stinks because if I ever find a pair I'd have to drive somewhere else to play haha. Anyway Golf has been on my mind lately since my PS3 died I've been playing the Wii and some Tiger Woods! 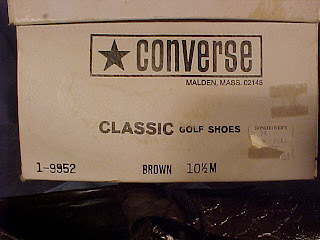 I hope someday Converse will make Golf shoes again, I just hope it's before I'm eligible for the seniors tour. Don't forget to follow along on Twitter @TheConverseBlog.